Lt Colonel Robert Chews private fotografier fra Norge og Skottland våren og sommeren 1945. Originalene ble donert til biblioteket i 2017 av Tony Chew, Robert Chews sønn. Depot av tysk krigsmateriell. Lt Colonel Robert Chew er nummer to fra høyre / Depot of German armament. Lt Colonel Robert Chew is number two from the right. Oberstløytnant, Lt. Colonel (Frederic) Robert (Gansel) Chew (1907-1970) i regimentet The Seaforth Highlanders kom til Bergen 10. mai 1945 som den første representant for øverstkommanderende for de allierte ekspedisjonsstyrker i Norge SHAEF (Supreme Headquarters, Allied Expeditionay Force). Hans hovedoppgave var å overlevere kapitulasjonsbetingelsene til tyskerne, og kontrollere at de ble overholdt. Under oppholdet møtte han Eva Mohr, født Gundersen (1917-1995) fra Bergen, og de giftet seg i 1947. Eva var enke etter flyfenrik Conrad Mohr (1914-1943) fra Fana. Han omkom i en flyulykke under trening i Little Norway i Canada. Fotografiene er tatt i Woodhaven, Oslo, Bergen og Vestlandet fra 8. mai og gjennom fredssommeren 1945. De er en gave til Bergen Off. Bibliotek fra Tony Chew, Robert Chews sønn. Sommeren 2017 digitaliserte Bergen Offentlige Bibliotek de 53 bildene og lastet de opp som fritt materiale på bildetjenesten Flickr Commons. Lt. 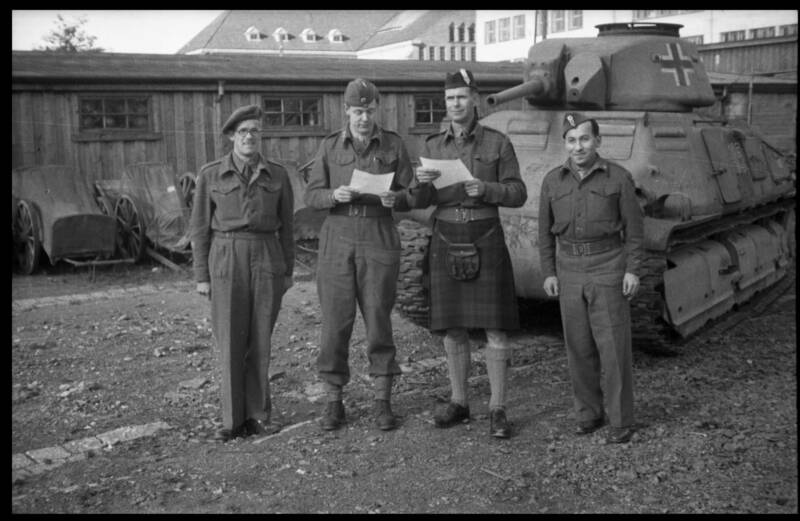 Colonel (Frederic) Robert (Gansel) Chew (1907-1970), of the Seaforth Highlanders regiment, arrived in Bergen on May 10th, 1945 as the first representative of the Supreme Headquarters Allied Expeditionary Force (SHAEF) in Norway. His primary objective was delivering the terms of surrender to the Germans, and making sure that the terms were upheld. During his stay in Norway, he met Eva Mohr (b. Gundersen, 1917-1995) from Bergen, to whom he got married in 1947. Eva was the widow of flight lieutenant Conrad Mohr (1914-1943) of Fana in Bergen, who perished during an aircraft exercise in Little Norway, Canada. 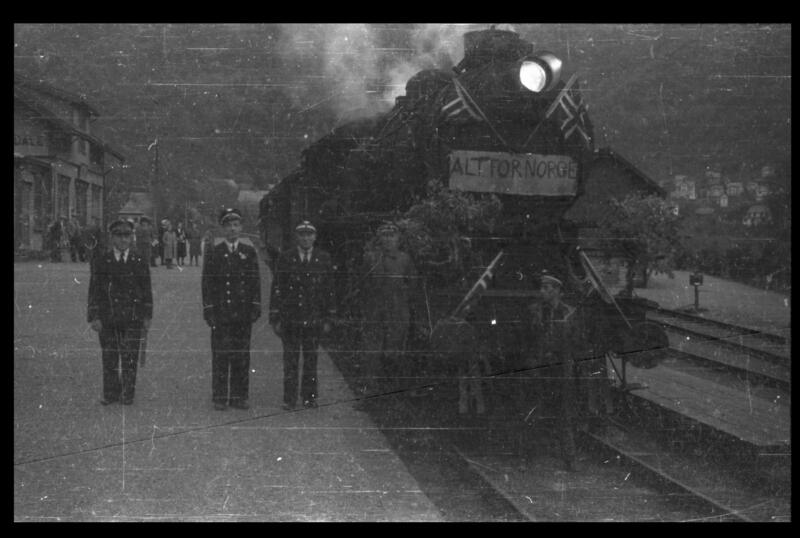 These photographs were taken in Woodhaven, Oslo, Bergen and on the west coast of Norway during the Liberation Summer of 1945, and were donated to Bergen Public Library by Tony Chew, Robert Chew's son. The library digitalized all 53 pictures and uploaded them to the public domain on Flickr Commons in the summer of 2017. Sølve Rydland, journalist i NRK, har skrevet Robert, Eva og Conrads historier i tre nettartikler. Hans intervjuer med Evas to sønner, Wilhelm (Bill) Mohr og Tony Chew, har gitt et levende bilde av foreldrenes liv i krig og fred. Artiklene ble publisert på NRK.no sommeren 2017. Sølve Rydland is a journalist at NRK (Norwegian National Broadcasting), where he has written about Robert, Eva and Conrad in three online articles. His interviews with Evas two sons, Wilhelm (Bill) Mohr and Tony Chew, have provided a vivid image of their parents lives during times of both peace and war. The articles were published on nrk.no during the summer of 2017. Bill Forster, engelsk forlegger og forfatter, skriver nettsiden for The V & W Destroyer Association. Han har laget en egen side om begivenhetene rundt de britiske krigsskip som kom til Bergen fra 15. mai 1945. Bill Forster (English publisher and writer) is editor-in-chief for the website of The V & W Destroyer Association, where he has chronicled the arrival of British naval vessels in Bergen from May 15th, 1945. Hvis noen har opplysninger om personer, skip, steder e.a. er vi takknemlig for tilbakemelding. If you are able to supply additional information about the people, vessels and places in these pictures, we would very much appreciate your feedback. Besetningen på “Pegasus“. Båten er den tyske FL.B 438. The crew of the "Pegasus". The boat is the German FL.B 438. Bildet på Flickr. 10. mai: Et ekstratog ble satt opp om kvelden 9. mai for å bringe Lt Colonel F.R.G. Chew til Bergen. Her er toget på Dale stasjon. May 10th: The extra night train from Oslo to Bergen at Dale Station. Bildet på Flickr.